Multi-Tip™ Bin Tippers are cost-effective, lightweight, and easy to move. Because of these attributes, they are a great solution for material handling and janitorial staff at schools, hotels, factories, recycling centers, warehouses, and beyond. Empower your staff to effortlessly empty boxes, trash cans, and other common containers with this state-of-the-art bin tipper. Lift-and-tip motion balances weight transfer for ultimate stability. Controlled bin lowering safely returns cradle to ground level. Durable, powder-coated frame is suitable for any environment. The Multi-Tip™ Bin Tipper suits popular bin sizes from 32 to 96 gallons (120 to 360 Liters). It quickly and safely empties a bin in 20 seconds. With a 330-pound (150 kilogram) capacity, this innovative bin tipper will prevent musculoskeletal injuries and allow staff to handle materials efficiently. 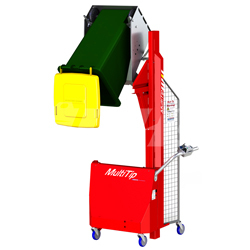 The Multi-Tip™ Bin Tipper is safe for indoor or outdoor use and has 5-inch (125 millimeter) casters (two with brakes) for optimal maneuverability. Contact our sales team at 1.800.BHS.9500 to learn more about the complete line of Bin Tippers from BHS. Find out how much more productive your staff can be with an ergonomic, powered bin tipper. Safety StandardsBin tippers can be specified to meet international standards and/or CE regulations for an additional cost, depending on environment, application, and other factors. Note: Tip height is approximate as it varies by bin being tipped.